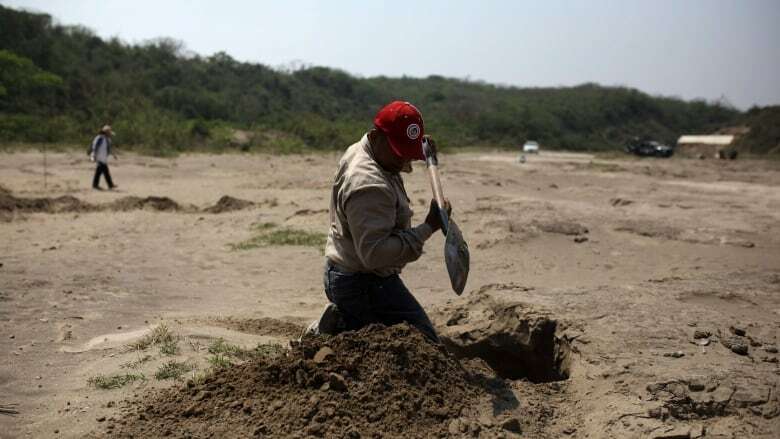 Mexican investigators have found 166 skulls in clandestine mass burial pits in the Gulf coast state of Veracruz. State prosecutor Jorge Winckler said Thursday that for security reasons he would not reveal the location of the site. Winckler said the bodies were buried at least two years ago. He said investigator had found 114 ID cards in the field, which held about 32 burial pits. Investigators found clothes, personal possessions and parts of skeletons in the pits, but they focused on the skulls in counting, because each corresponds to one person. Winckler did not rule out finding more bodies. Maria de Lourdes Rosales Calvo, who has been searching for her son Jonatten Celma Rosales since he was abducted with his girlfriend in July 2013, said the news of the newly discovered burial pits "gives hope." Four days after they were taken, she received a call demanding ransom and was warned not to go to the authorities. She paid a fraction of it for five seconds on the phone with someone who might have been her son. It was only long enough to hear him say, "Mom," and then the line cut. She did not hear from them again.